When it came to furnishing the living room in my new house, it was easy! I would see the right piece of furniture (like the coffee table or sofa) and know right away it was perfect. Even the rug was an easy decision. But for some reason, finding the right accessories has been less intuitive, especially because I really want to bring out some of the yellow that’s in the detailing of the rug. So after much searching for the perfect throw pillow cases and not really finding exactly what I wanted, I decided to make them instead! This project is simple, and would be a great way to refresh your own living room for spring. I used gray and yellow for my colors, but you can substitute these colors for whatever colors work well in your own living room. And have fun with it! You will need a square 20” x 20” in your neutral burlap, a square 20” x 20” in your color burlap, and a rectangle 10” x 20” in your color burlap. Be aware that burlap can be a little “wiggly” to work with. (I know that’s not a technical term, but you’ll see what I mean.) 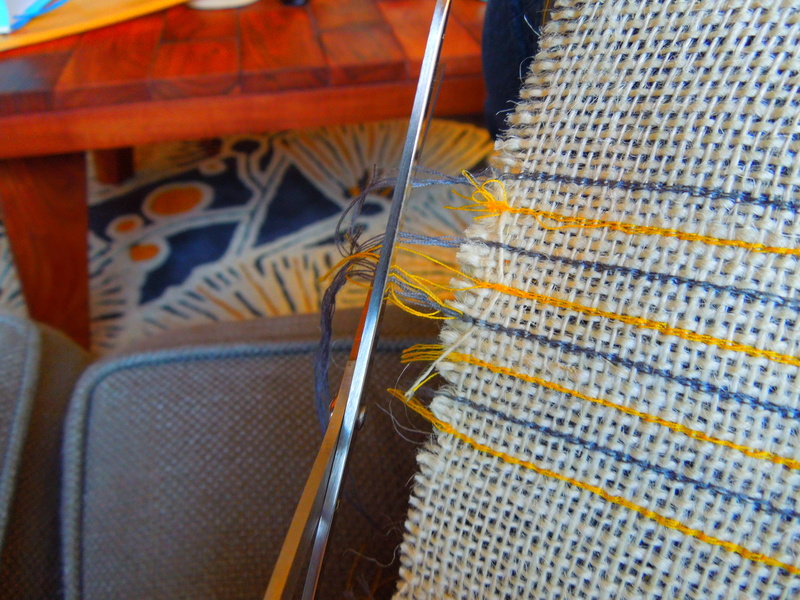 The straight line you cut on may not perfectly align with the weave of the burlap, so be sure to create your own straight line and stick with it. I recommend starting with the outside lines on either side and work your way inward. I started with lines 4” from each side by marking a 4” point toward the top and again at the bottom, and then connecting the dots. 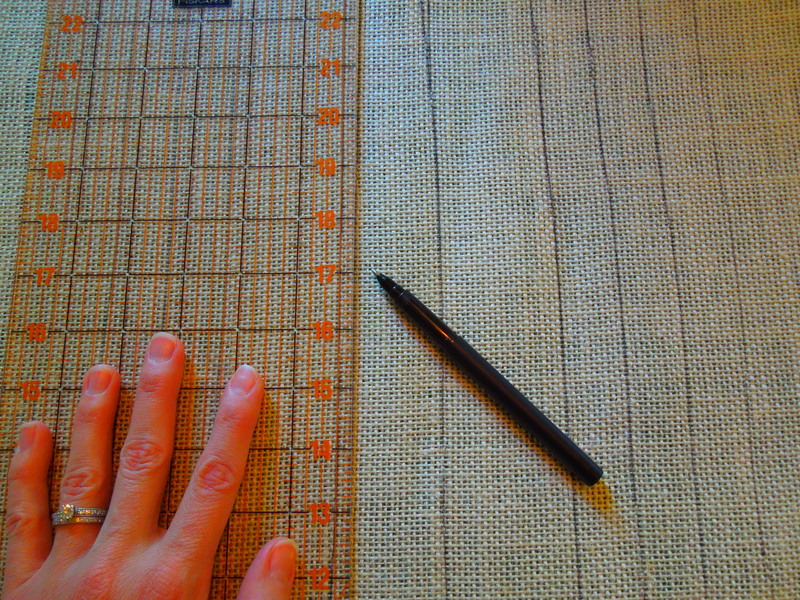 Do your best to make sure the edge of the fabric stays straight and then use the length of your ruler to draw the whole line top to bottom. My next 3 lines on either side worked their way inward 1” at a time. Then I left 2” between the next line, followed by a series of lines ¼” apart from each other in the center. This pattern makes for a nice variation in the design while still looking structured, clean, and intentional. This is where those colors start to come to life! Use the lines you drew to be sure the needle on your sewing machine stays in a straight line as your fabric moves through it. 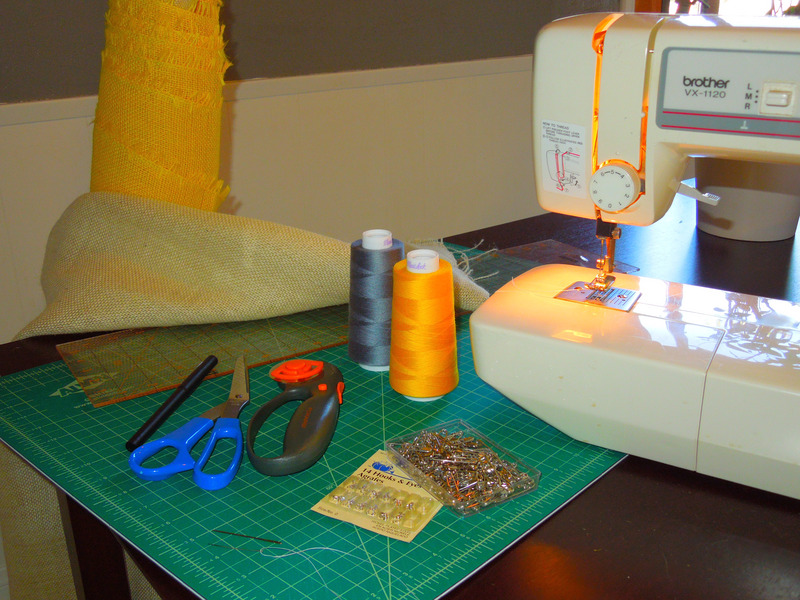 Each time you you finish one line of thread, gently stretch it out to avoid bunching. 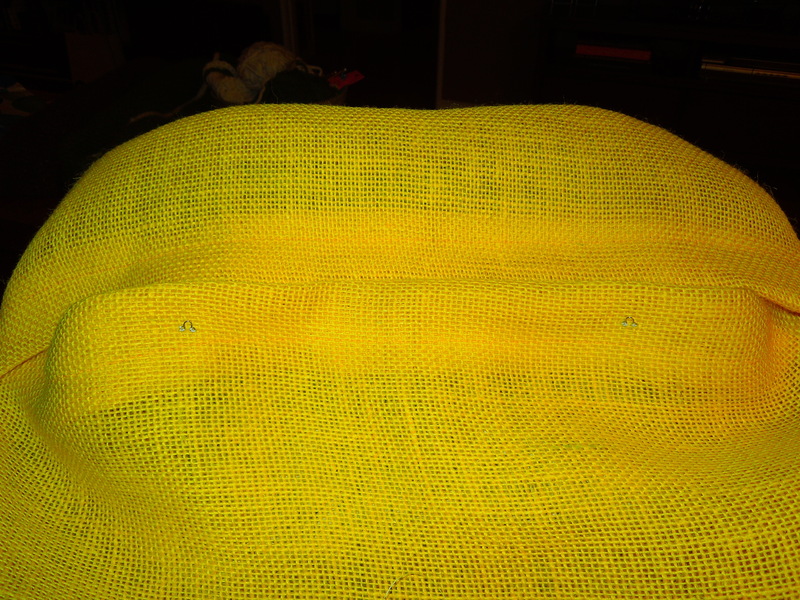 Depending on your fabric and how bold you want your colors to show, you may want to go over it a couple of times. I found that three runs for each line gave me the look I wanted. Also, remember you have 2 colors, so alternate the colors you use for each line. 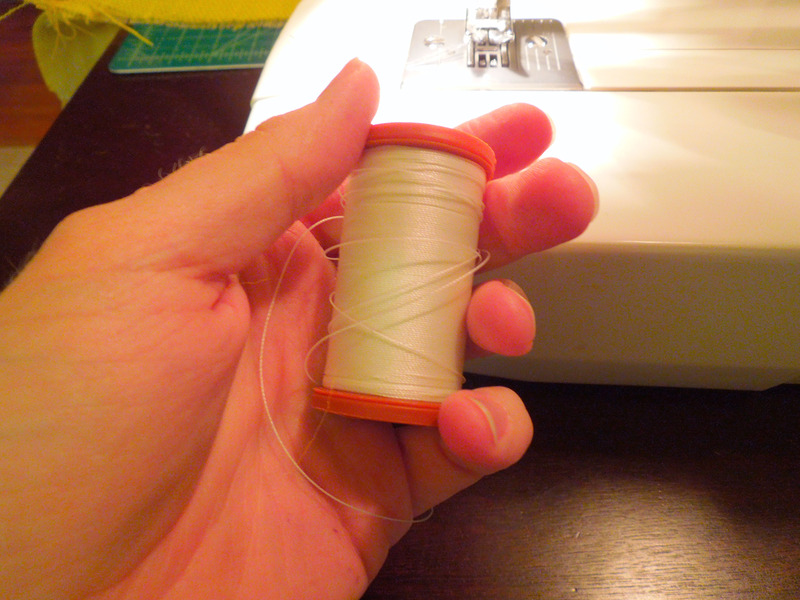 You can do all your lines of one color on every other draw line, then switch the thread in your sewing machine and do the alternating lines you skipped the first time around with your second color. **Be sure that the thread in your bobbin always matches the thread in your needle; we will be flipping this design over and using the back side as the outward-facing side of the pillow cover. When you are done with the line design, flip it over and take a look at what will soon be the front of your pillow. Pretty cool, huh? You can start to see it coming together! Because you will be using what was the back of the sewn fabric as the front of your pillow, you may notice some stray threads from where you may have lost a thread and had to pick it back up, or maybe the top end of the thread from your previous line got caught up in the next one. 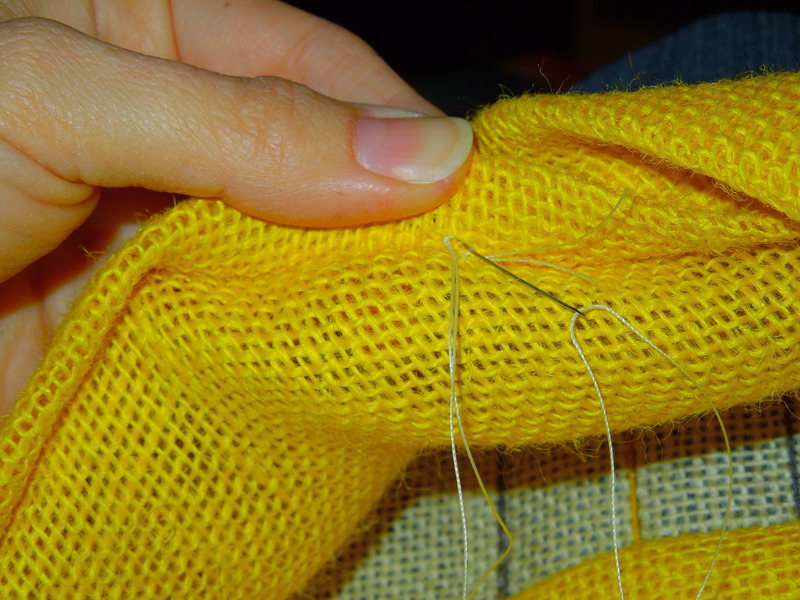 Since the weave of the burlap is so loose, I found it easiest to use a thin darning needle to thread the stray ones and push them back through to the other side. 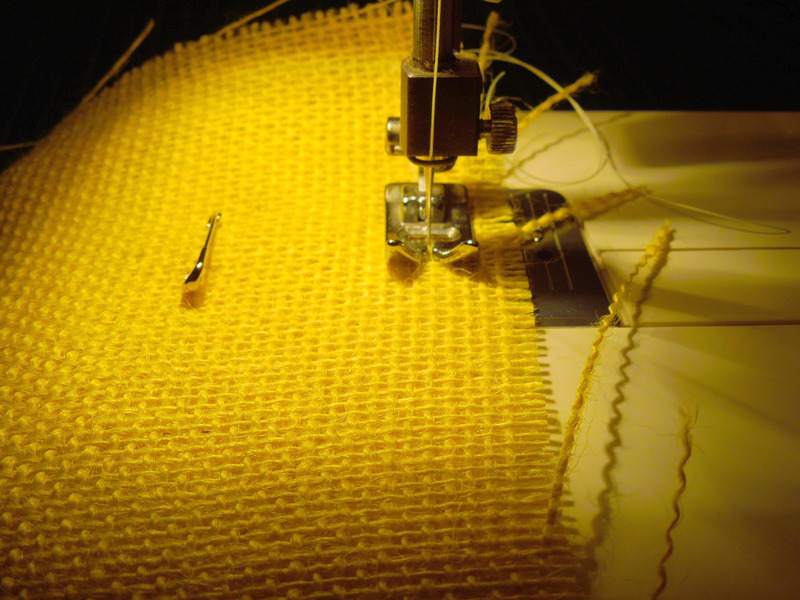 Take a few minutes to make sure you have pushed through and secured any stray threads, and freed any threads that may have gotten accidentally sewn into the design. 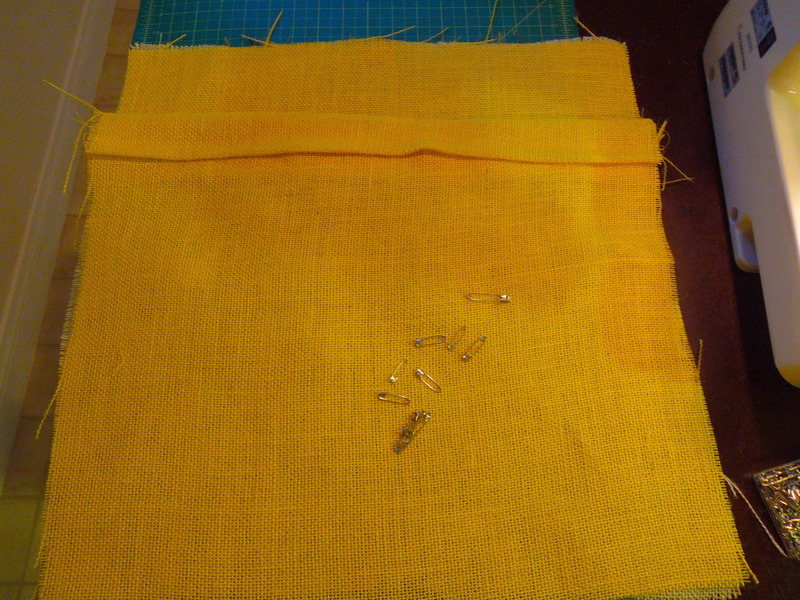 Then cut the edges of the thread at the top and the bottom so they are only about ½” long on either end. This side is in two pieces to make it easy to get your pillow insert in and out for cleaning. For each the 20” x 20” color burlap square and the 10” x 20” color burlap rectangle, you will need to fold one 20” side down about 2” and iron down the fold. Then fold it over again maintaining an approx. 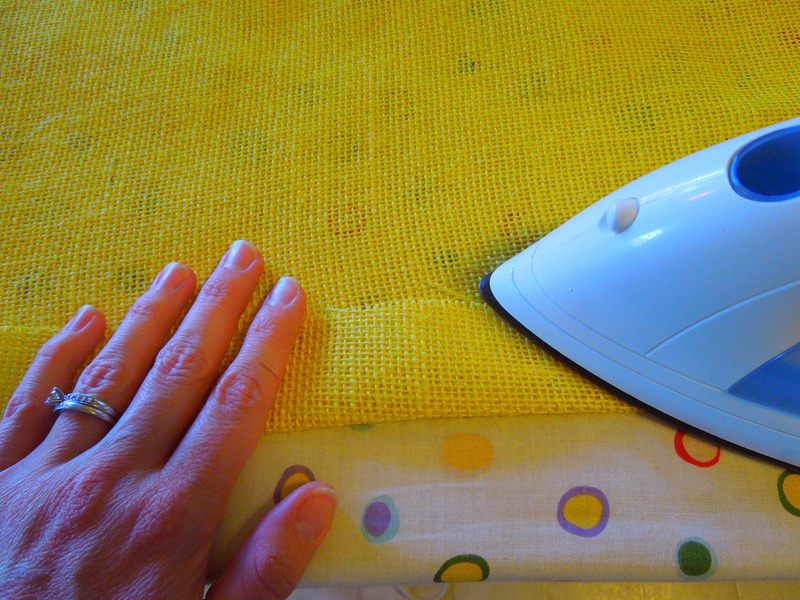 2” overlap, and iron down the second fold. 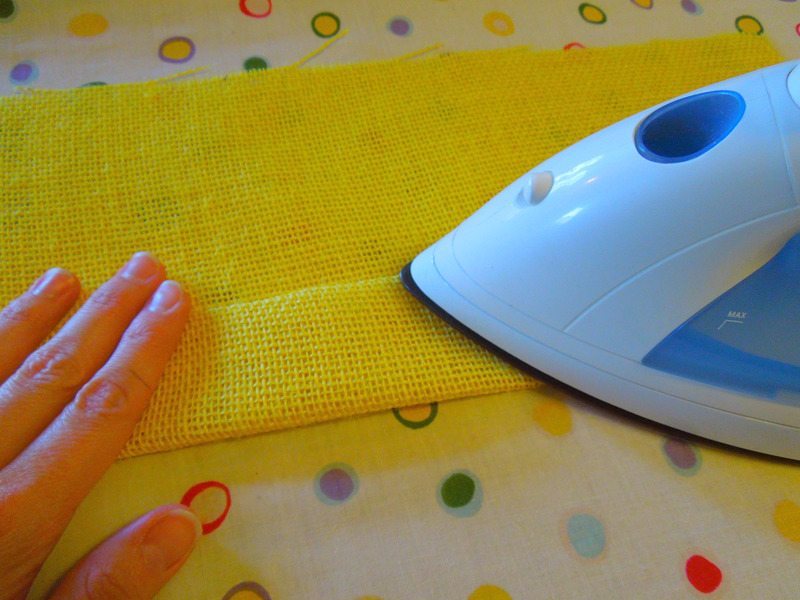 Take your two 2” folded edges to your sewing machine (remember, there should only be one 20” long hem for each color burlap piece) and sew a hem approximately ½” from the second fold. Use thread the same color as your burlap to keep the hem hidden and the opening on the back of your pillow less noticeable. Lay down your neutral burlap square (the one with the line design) so that the outside of your pillow cover faces upward. 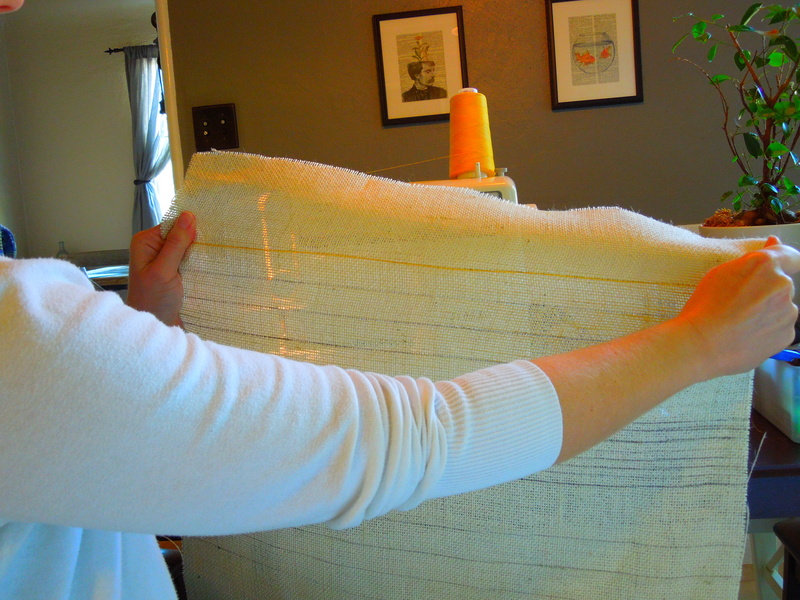 Next, lay down the smaller of your color burlap pieces so that the rough 20” edge is lined up with the top edge of the neutral burlap square and the smooth side of the hem is facing downward. 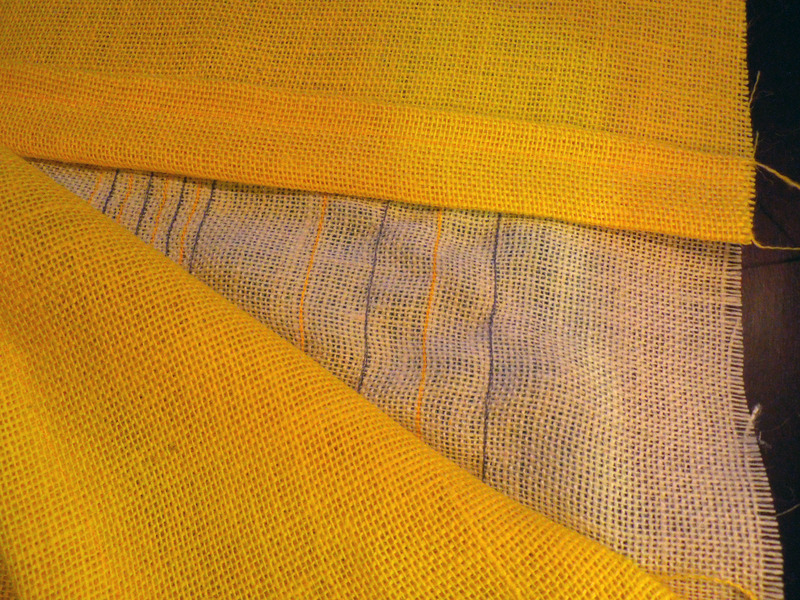 Finally, lay down the bigger of your color burlap pieces with the rough 20” edge lined up with the bottom edge of the neutral burlap square and the smooth side of the hem should also be facing downward. Now you’ll need to pin it all into place. Because the weave of the burlap is so loose, I recommend using safety pins so the pins won’t slip out unexpectedly. Use the safety pins to secure all four sides, about 1½” from the edge to allow enough room for the sewing machine foot to move along the edge without you having to take out the pins as you go. Next you will sew the pieces together! 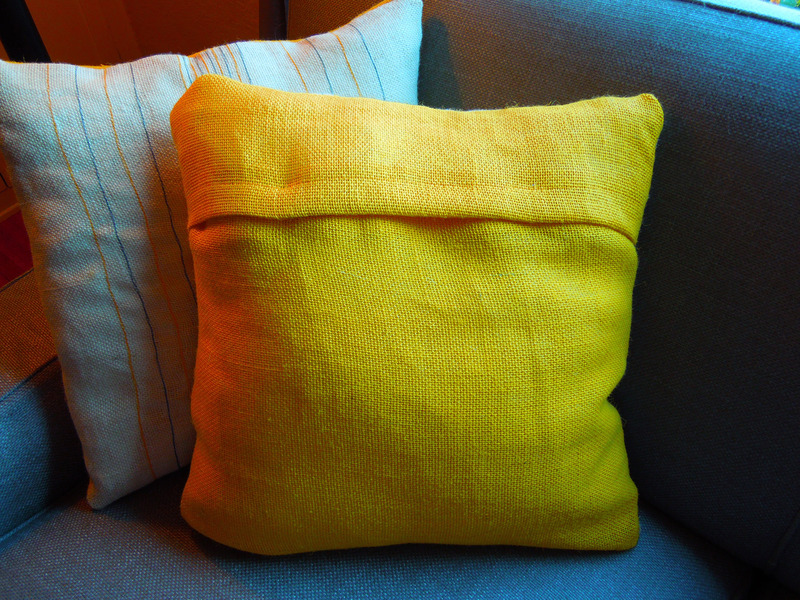 I used a strong upholstery thread for a little extra durability when putting the pillow insert in or out of the cover. 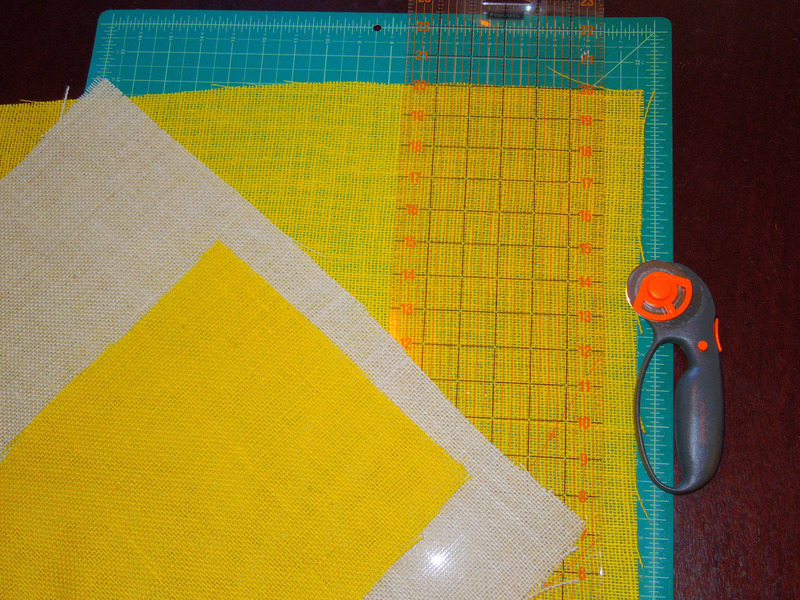 Simply sew along each side about ½” from the edge. You now have a pillow cover! Flip it right side out, and see the fruits of your labor! This final step on your pillow cover is meant to keep the back closed so the pillow insert doesn’t bulge out. 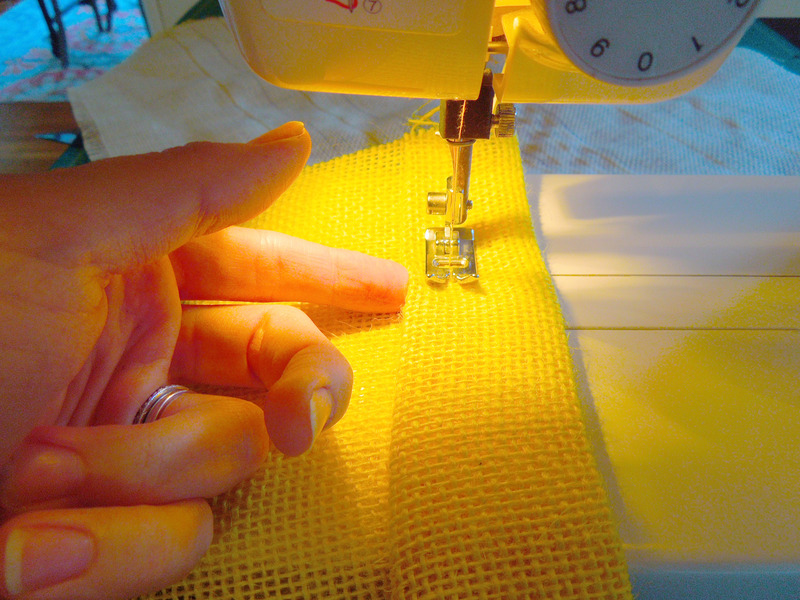 You’ll need to hand-sew two eyes to the hem of the larger back piece. I found placing each of them about 4” horizontally from the center in each direction, and about ¾” from the folded top, works pretty well. 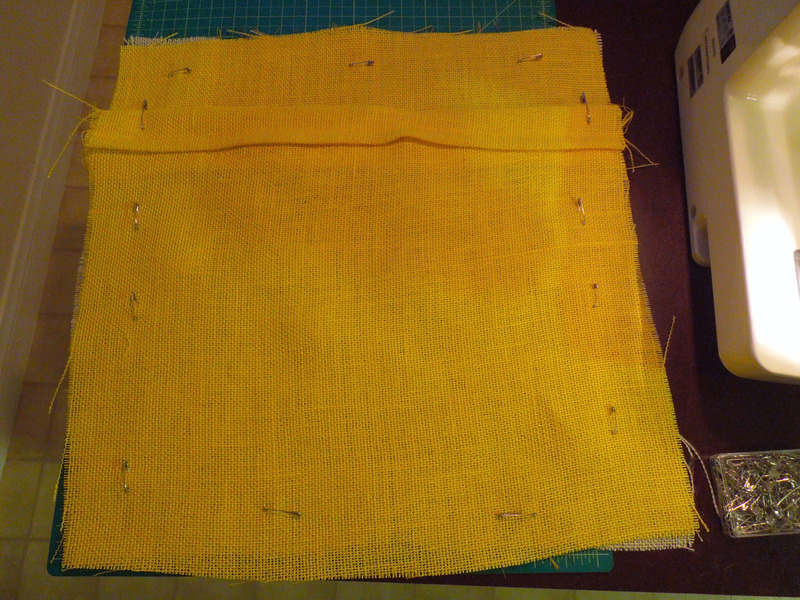 Then sew the corresponding hooks to the smaller back piece. You’ll need to be sure that the hook lines up vertically with the corresponding eye. 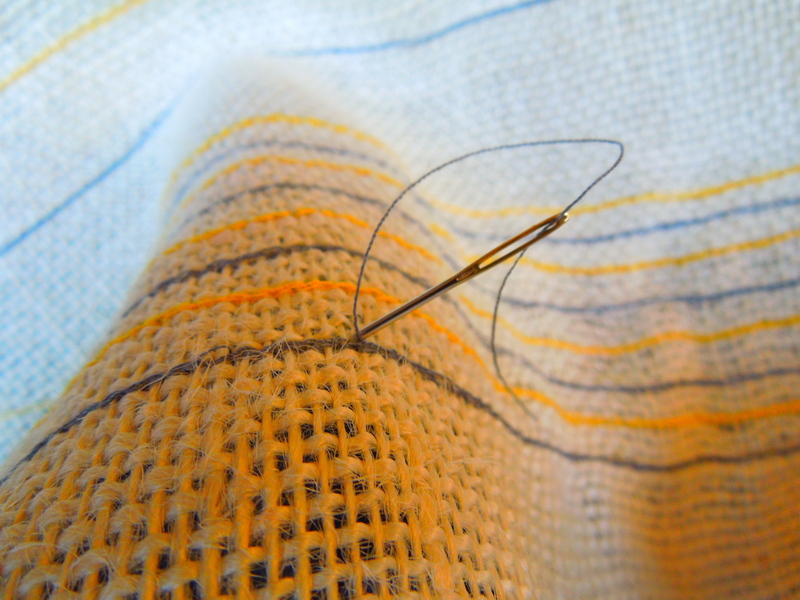 Then sew it on the inside of your pillow case, just below the thread of your hem. This will allow you to sew through to the other side of the excess folded fabric so you won’t have any thread showing on the back side of your pillow cover. 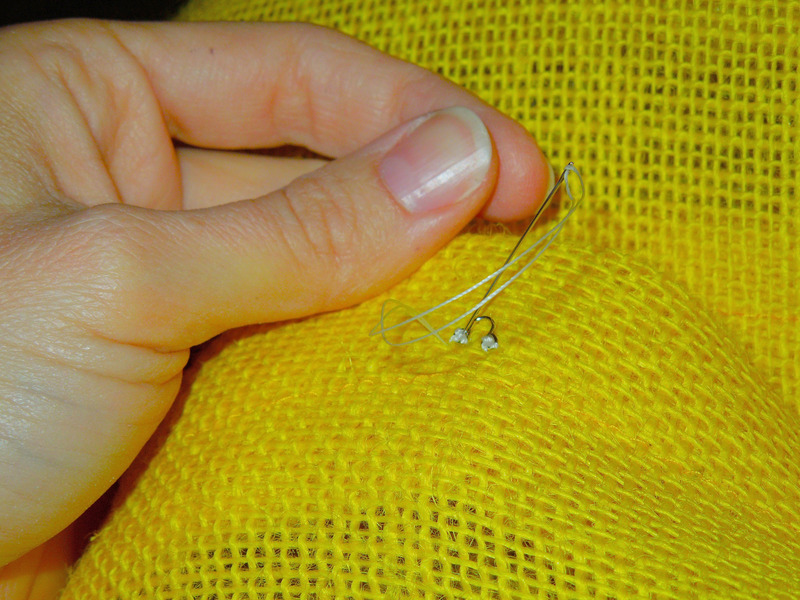 Make sure your hook is facing the proper direction to hook onto the eye and keep your pillow cover closed. Congratulations, you now have a new throw pillow cover! Stuff that pillow insert in there and enjoy. And when people ask where you got it, you can proudly say you made it yourself! I love a good project with a tangible outcome that I can be proud of. I’d love to hear your feedback on this project, so if you try it out, let me know how it goes! This entry was posted in Projects and tagged #accessory, #anecdotagoat, #burlap, #craft, #diy, #livingroom, #pillowcover, #project, #refresh, #sewing, #spring, #throwpillow. Bookmark the permalink. Great directions to make a fun pillow!!! Visiting from SoCal Lady Bloggers. I like your pictures. Ooh!! Cool tutorial! I love burlap, I almost always find some use for it in the parties I throw. I am also visiting from SCLB.